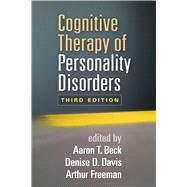 This widely used practitioner resource and training tool is the definitive work on understanding and treating personality disorders from a cognitive-behavioral therapy (CBT) perspective. The prominent editors and contributors explain the nature of personality disorders and why they are so challenging to treat. Chapters addressing 12 specific disorders are organized around vivid, instructive clinical examples. The book provides up-to-date scientific knowledge about each disorder and describes effective strategies for differential diagnosis, case conceptualization, implementing individualized CBT interventions, and overcoming roadblocks. *Incorporates cutting-edge clinical approaches and research; expands the cognitive theory of personality disorder. *Chapters on neural mechanisms, cultural diversity issues, and depressive personality disorder. *Chapters on co-occurring disorders and management of clinical challenges. *Disorder-specific chapters now include sections on key treatment goals, progress and termination, and clinician self-care. *Discusses DSM-5 concepts and diagnostic criteria. *Reviews advances in assessing personality beliefs. Aaron T. Beck, MD, is the founder of cognitive therapy, University Professor Emeritus of Psychiatry at the University of Pennsylvania, and President Emeritus of the Beck Institute for Cognitive Behavior Therapy. Dr. Beck is the recipient of numerous awards, including the Albert Lasker Clinical Medical Research Award, the American Psychological Association (APA) Lifetime Achievement Award, the American Psychiatric Association Distinguished Service Award, the Robert J. and Claire Pasarow Foundation Award for Research in Neuropsychiatry, and the Institute of Medicine's Sarnat International Prize in Mental Health and Gustav O. Lienhard Award. Dr. Beck has worked extensively with personality disorders and has been an investigator on two studies using cognitive therapy with borderline personality disorder. Denise D. Davis, PhD, is Assistant Director of Clinical Training in Psychology at Vanderbilt University. She is a Founding Fellow of the Academy of Cognitive Therapy (ACT) and a Fellow of the APA, and is certified by the ACT as a trainer, speaker, and consultant for cognitive therapy. Dr. Davis was the founding Associate Editor of the journal Cognitive and Behavioral Practice prior to serving the first full term as that journal’s Editor. Her research and clinical interests include ethics, psychotherapy termination, and cognitive therapy of personality disorders. Arthur Freeman, EdD, ABPP, is Professor of Behavioral Medicine at Midwestern University, where he is Executive Director of the Clinical Psychology Programs at both the Downers Grove, Illinois, and Glendale, Arizona, campuses. He is a past president of the Association for Behavioral and Cognitive Therapies and the International Association for Cognitive Psychotherapy and a Distinguished Founding Fellow of the ACT. With over 100 chapters and articles, his work has been translated into 20 languages and he has lectured in 45 countries. Dr. Freeman's research and clinical interests include marital and family therapy, and cognitive-behavioral treatment of depression, anxiety, and personality disorders.